The Saturday before my first book signing, my husband and I put up ten flyers in Brookshire, Texas, announcing the event. Even the businesses that did not have community bulletin boards were enthusiastic. Subway, Church’s Chicken, and Pizza Hut graciously made space on the counter or door. When Linda, the librarian, threw her arms around me and said “It was wonderful,” I returned home satisfied. Later I had a twinge of disappointment when I realized that not one person who attended had come as a result of the flyers. But I quickly reminded myself that I plant the seed and God gives the increase. 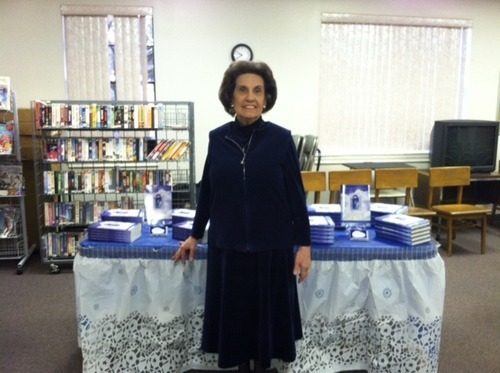 Katy Branch Library hosted me on Saturday, January 25, a beautiful sunny afternoon. Angel, the librarian, who lives up to her name, had advertised throughout the week with posters and flyers she made. She also readied the meeting room with tables, chairs, podium, and a microphone. Because nothing can be sold in Harris County public libraries except for their fundraisers, I displayed only a softcover and a hardcover of Before the Door Closes. Something new this time was a “watering” table using infusion pitchers. The lemons were from the tree in our backyard, and the mint, too, was home-grown. Small pastel mints made a sweet addition. Wanting to experiment with impact results, I varied my readings from those I used at Brookshire-Pattison Library. During the discussion time, one of the attendees felt comfortable sharing about her relationship with her alcoholic mother. She told me later that was rare for her. As we drove home from our second library author event, I had a rude awakening. Not one person attended as a result of the flyers my husband and I had spread throughout the area in hardware stores, grocery stores, restaurants—even a community college. And I was so proud of them too! Office Max’s quality printing had made the colors of my book’s cover pop on the announcement. This was no dull black-and-white product. The “Meet the Author” listing on the front page of the Katy Times apparently hadn’t sparked anyone’s interest. At least not enough to come today. My daughter’s Facebook labor birthed nary a body. Nor did my event listing on Amazon’s author page produce a result. I faced the obvious fact: Everyone was there through word of mouth only by family and friends. The Katy Lions Club is a friendly, inviting group of men and women, who are truly service oriented. It was easy to enjoy an evening with them on February 6. The highlight for me was that a visiting Lion from Canada (and also the daughter of an alcoholic) bought my book. Now it has a Canada connection. Combined with the fact that the mother-in-law of a friend has a copy in Malta, I feel that Before the Door Closes has truly gone international. The Valentine decorations were no match for the beauty of the love shared by women at this luncheon. Since the church had made available Before the Door Closes: A Daughter’s Journey with Her Alcoholic Father two weeks prior, most of the women had already read my book or had started it. After a few minutes of introductory remarks about why I wrote my story, the ladies were anxious to share their relevant experiences and ask questions. As I autographed copies at the close, hurting hearts cried the pain they could not reveal in the group discussion. All but a tablespoon of my contributed three-bean salad was eaten. Below is the fifty-year-old recipe from a Kentucky-Tennessee cookbook. No author event is so small that something meaningful is not realized or shared. After finishing Before the Door Closes: A Daughter’s Journey with Her Alcoholic Father, the readers, I am discovering, often want to ask me questions. I am happy to answer all of them. In November of 2013 six women who had read my book immediately upon publication eagerly accepted my neighbor’s invitation to discuss it at her house. The ladies who came to my home on April 19 had told me two months prior my book had left them with lots of questions. Our discussion was scheduled between one and three. It was after four o’clock when the talkfest ended. Ironically, while I was answering all of their questions evoked by Before the Door Closes, these widows, whom I had known for years, revealed their husbands had been alcoholics. As they shed light on their secrets, I sensed this “book” discussion had been their catharsis. The giveaway for one autographed copy of my book ran from June 2 to June 5. There were 652 entries; and 287 people added Before the Door Closes to their book shelves, bringing the to-read total to 301. The winner lives in Canada. I had fun watching this event develop. I was asked to bring the devotion at First Baptist Church of Brookshire’s Seniors Day. Philippians 1:6 was my focus scripture: “And I am convinced and sure of this very thing, that He Who began a good work in you will continue until the day of Jesus Christ [right up to the time of His return], developing [that good work] and perfecting and bringing it to full completion in you” (AMP). Using excerpts from Before the Door Closes, I showed how God worked in me in my sixties to overcome my fear of the male authority figure that my alcoholic father had nurtured in me as a child.